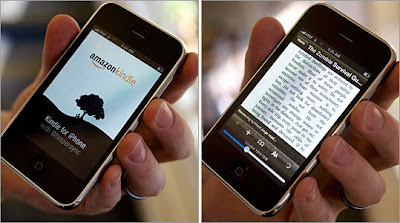 I read a lot of books on my Kindle for iPhone. I've been asked how I can adjust to the small print, but I don't think it's much different than reading a paperback. I've also been asked how I could possibly forgo a traditional book. There are definitely pros and cons I've found with an eReader. *The book is downloaded in one minute flat! No travel or waiting involved. You can also read sample pages before purchase. *You can read it anywhere. In waiting rooms, on planes, etc. and I always have it with me, because it's also my phone (not true of other kinds of eReaders). *You can read it in bed. No book light is necessary and no worries about disturbing anyone next to you -if you have someone next to you *cough*. *You can't flip back to re-read your favorite pages easily. In fact I think it's nearly impossible. Plus the pages are numbered funny. * You can't fully appreciate a beautiful cover or smell that book smell. * Sometimes there are formatting issues: typos, mismatched lines etc. By the way, if it's a book I just need to own, of course I'd buy a hardback copy for my bookshelf! Oh, and it still can't beat an afternoon browsing at the bookstore! So I think there's room in my life (and in the publishing world) for BOTH! You've made it inticing since it's part of the phone, it would be great for road trips, plane trips, things like that, however I've never been good with motion and don't know how frequently I would use it. I think I'm a bookstore type of gal, I really enjoy visiting the bookstore, buying those books, feeling them, having them signed. I mean who can really sign an ebook? I love the compactness and availability of books of the ebooks, but I just think I'm on the computer so much for writing that I want to look at paper for enjoyment....So far I'm a traditional reader. One day I may change my mind! Hmm. I've been pondering the whole book -v-ebook for ages. I'm a huge bookstore girl, like Jen. I can imagine reading an ebook on a reader in a pinch, but there's nothing like the hard copy for me. It's cool to see your pros and cons (I had my own list of what I thought a purely digital future would change). Personally I welcome our digital overlords. I love browsing in a bookstore, but when I know what I want (and I often do) a bookstore is the LAST place I want to look for it. I LOVE my sony reader but it will never replace real books for me. Example- I happened to notice Mockingjay was available in the sony reader store a DAY BEFORE it was released, and I squealed with excitement and had bought/read it that night. And the next day I bought the hard copy just to complete my hard copy collection. I don't do this with every book, obviously, but for a few books it's really awesome to have an ereader. I've been wanting a Kindle for a while now. I love how it replicates the look of a page, without the harsh lighting. The expense is warranted, I think, because I love to read! BUT... I love holding that book! I love the smell. I love to look at it from the top with my bookmark poking out to see how far I've come or how much I have to go. BUT.... with a Kindle, the weight is absent. Those hardbacks can be HEAVY! This is so tough! I was discussing books vs e-books with a co-worker the other day and one thing I thought of that hasn't been touched on to my knowledge: What about when you're dating and you meet someone new, and you go to their place, and you get to see the books they keep on their shelf? That is such a wonderful way to get to know someone. You can't do that with e-books. One thing I don't like about my kindle...I can't share books. :-( and I love to say to someone, "oh this is so good, here read it." See, now when I get a Kindle, I can still go to the bookstore and browse. I might even buy the hard copy book, but with a Kindle, I can also check reviews of the book before purchasing. I use the Kindle app for my netbook, and it's okay. I can go back in a book, I just slide the bar at the bottom to where ever I want to go. I love the instant buy and unlike other people, I have no affection for book smells. In fact, I've had to not read some books because of the musty smell. I bought one at a used bookstore, but when I opened it to read, omg, it was SO musty, it made my nose run. However, I do like the look of books on my shelves. :-) So, I know I'll continue to buy the hardcopy of some of them. I was on a short flight recently (Milwaukee to Minneapolis) and they wouldn't let me use my Kindle at all!! It was a total bummer since I had nothing else to read. So, yes, you can read your e-readers almost everywhere, but the beach, the bathtub, and the start and end of flights are probably off limits!! Oh, there's definitely room for both. I like to read on my computer, my phone, and in the car. That's nice to not have to pack a bulky book. But I LOVE to stroke covers. And stare at them. And salivate. That's why I love the printed book. Oh I am so old fashioned in some places. I love books. However your pros are excellent points. Have Kindle for PC & actually get books in less than a minute! I love that part of it. I can adjust the color of the background & font size. Handy. No page numbers, but I'm used to scrolling. As a bookseller, I've watched the e-reader moving in over the past year, and honestly, I love the features of the one my company sells. I'm not just saying that out of loyalty, either! If I could get one, I probably would purely for the ease and compactness of taking any title I want anywhere. I do have an app of our reader downloaded on my Touch, and I've been reading a book on it, but honestly, it's taking me forever to do so. I'll get through several actual books before I finish my little book on my iPod! That said, I still love the idea of an actual book, and always will. I love charting my progress with my trusty bookmark, or marking a passage that moves me, or being able to hand a book to a friend and tell them they must read it. I love the smell and feel of a tangible book. I still prefer books over ebooks, especially since I can't use my gift cards yet for my Kobo. However, more new books are coming out right away for the Kobo device, so maybe I will start getting them that way. The hard thing is, I keep buying books before I have a chance to finish what I have (my pile is huge). With the Kobo, I'd have to make a list of the ones to read or else they'll be forgotten.